27 Mar 2018 --- A chocolate bar that contains 30 percent less sugar than usual is making its debut in the UK and Ireland as Nestlé unveils an innovative sugar reduction technique that is being hailed as a scientific breakthrough because of the way it “restructures” sugar. Researchers from the Swiss giant have pioneered the “Milkybar Wowsomes” range, describing this as the first chocolate bar in the world to use Nestlé’s innovative sugar reduction technique. The science behind the bar transforms the structure of sugar through a newly developed process using only natural ingredients and is inspired by candy floss (cotton candy). Experts created aerated, porous particles of sugar that dissolve more quickly in the mouth and on the tongue. This allows someone to perceive the same level of sweetness as before, but with much less of the ingredient and consuming less sugar. The new tech takes normal sugar and sprays it into the air with added milk and water which results in a porous product that is easier to dissolve in water, i.e., saliva. Nestlé insists the new technology provides the same sweetness. 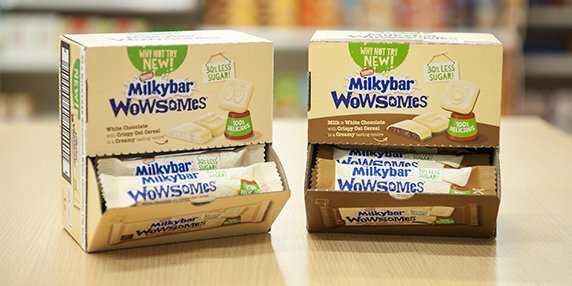 By using this groundbreaking technology, Milkybar Wowsomes – which hit the shelves in Britain and Ireland in the coming weeks – has 30 percent less sugar than similar chocolate products and contains no artificial sweeteners, preservatives, colors or flavorings. The number one ingredient in Milkybar Wowsomes is milk, it’s gluten-free, a source of fiber and also contains crispy oat cereal pieces. Click to EnlargeThe range has products in different sizes for different occasions and the largest sized bars are 18g and have 95 calories each. It has taken Nestlé teams in Switzerland, the UK and the Czech Republic just over one year to take the scientific, technological breakthrough and transform it into a confectionery product, the company reports. “It is with great pride that the UK and Ireland become the first market in the world to use this exciting technology to create such a great tasting confectionery product. We have an unrivaled research and development network and the experts at our Product Technology Centre in York have been instrumental in this breakthrough,” says Stefano Agostini, CEO of Nestlé UK & Ireland. Nestlé’s work on sugar reduction follows pressure from the UK government on confectionery companies to play their part in reformulating products and cutting down on sugar content as part of the nation’s efforts to tackle childhood obesity. Last year Public Health England (PHE) set a voluntary target for food manufacturers of a 20 percent sugar reduction by 2020 with a 5 percent decrease in the first 12 months. The unveiling of Milkybar Wowsomes also comes ahead of Britain’s sugar tax on soft drinks which is also part of the government’s strategy to encourage healthier diets and reduce the number of sugary beverages consumed by UK children. The sugar levy comes into force on April 6. As the demand for low and no-sugar products continues to rise, Nestlé UK and Ireland continue its mission to cut sugar across its portfolio. The amount of sugar in Nestlé’s UK and Irish products has been seriously slashed over the last three years, with the equivalent of more than 2.6 billion teaspoons being taken out of products through innovative reformulation. In a pledge last March, the company said it would strip out sugar across its confectionery portfolio by 10 percent by the end of 2018 – but it has already hit a reduction of 7.4 percent to date. At the time, we reported how Nestlé is in the process of patenting new sugar technology. 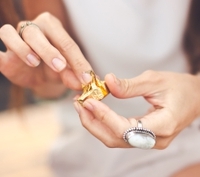 Using only natural ingredients, researchers have found a way to structure sugar differently. So even when much less is used in chocolate, your tongue perceives an almost identical sweetness to before. The discovery, which was announced at the end of 2016, will enable Nestlé to significantly decrease the total sugar in its confectionery products while maintaining a natural taste. It has the potential to reduce the total sugar by up to 40 percent in the company’s confectionery. You can read more about this technology here. And a report published earlier this month reveals how Nestlé UK & Ireland includes some of the biggest examples of reformulation to reduce sugar and calories in its famous brands such as KitKat, Milkybar and Cheerios, as well as the latest changes to Sanpellegrino which will see the sparkling fruit-based beverage have a 40 percent reduction in sugar in the coming months. “We announced earlier this month that we have taken out more than 60 billion calories and 2.6 billion teaspoons of sugar from across our food and drink portfolio in the last three years,” said Stefano Agostini, CEO of Nestlé UK & Ireland. Jas Scott de Martinville, Global Lead for Nestlé Confectionery Research & Development (and Head of Nestlé’s Confectionery Product Technology Centre in York, UK) said the ambition behind Milkybar Wowsomes was enormous and it has been a real challenge to get to this stage. “To create a confectionery product in just 12 months which has 30 percent less sugar than similar chocolate products and contains no artificial sweeteners is extraordinary,” she said. Milkybar Wowsomes is an entirely new product under the Milkybar brand and will be available in single bars, multipacks and a stock-up bag with individually wrapped single pieces. It comes in two variants, white chocolate and combined milk and white chocolate. Each piece is made of smooth white or white and milk chocolate and has a creamy-tasting center containing crispy oat cereal pieces. While the new technology is the most obvious new development for the brand, this is also the first time in Milkybar’s 81-year history that it has contained both milk and white chocolate in the same bar. Milkybar was originally launched in the UK in 1936 and is one of Nestlé’s most iconic chocolate brands. In 2007, the brand moved to no artificial ingredients, and in 2017, milk became the number one ingredient in the recipe. Confectionery Nestlé Milkybar Wowsomes Sugar Tax Aerated Porous Public Health England Technology.